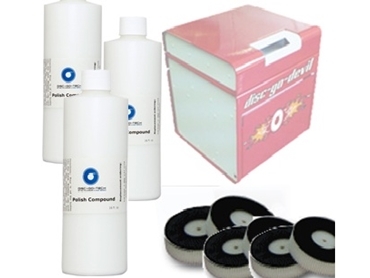 Disc-Go-Devil Triple Packs of disc cleaning consumables from Discstation Australia Pty Ltd consist of three 500 ml bottles of polish, three sets of pads together with a bonus 50 ml optical spray and microfibre cloth. These disc cleaning consumables are for use on Disc-Go-Devil machines and remove scratches from DVDs, CDs, Blu Ray discs and computer games such as PlayStation PS3, Xbox 360 and Nintendo Wii. Discstation Australia calculates that 3000 discs can be cleaned and polished using one Triple Pack. The most popular setting is a 30 second cycle and the Disc-Go-Devil is a continuous use machine. This means that there is no need to rest the machine for cleaning or cooling between pad changes so the maximum amount of discs can be cleaned in a timely manner. There is an in-built alert system which warns the operator via the digital display that the consumables need replacing. The machines can deliver between 20 and 30 cleaned and buffed discs per hour, day in and day out.